Where have we been, where are we going, what will this mean for youth and kids of the future? How can we best use media and technology to raise the collective IQ of humanity toward problem solving? How do we “collectively use technology to map our future with integrity mindful of the perspectives of others and future generations? Our NextNow Collaboratory has a ton of folks volunteering on site here besides me at the Tech Museum of Innovation, so I’ll hunt down some of the live bloggers, and meanwhile you can catch some of the amazing collective knowledge being shared at the Program for the Future virtual hub created on ning! Exciting times…Mei Lin Fung has been a gracious host an amazing point person pulling this all together, and Steve Wosniak was as jovial, fun-loving and childlike in his ability to laugh and engage with others (who else would tape a Big Gulp cup to the top of his car hood just for a reaction?) as ever imagined. p.s. In his new book Evolving Collective Intelligence brought to life by Next Now artist/scribes Eileen Clegg and Valerie Landau in beta form right now, you’ll read about the vision behind the inventor of the computer mouse that goes FAR beyond technology. “The Engelbart Legacy Project collaboration supports the development of artifacts, web-based communities, interactive events and exhibits, and publications that will help us visualize and re-imagine efforts made over the last 40 years to augment human intelligence through the co-evolution of human systems and technology, specifically as originally envisioned by pioneer Doug Engelbart. 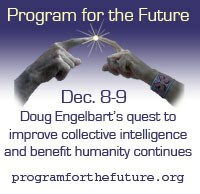 “For all of us working with the powerful extensions of Doug’s ideas that now exist on the Web, on our desktops, laptops and mobiles, this is a time to celebrate Doug’s extraordinary vision and his lifelong quest to help us all reach the heights of collective intelligence necessary to deal with increasing complexity and wicked problems of a globalizing world.” http://collectiveiq.blogspot.com. – What is Writing on the Walls (or graphic recording)? – Who is Doug Engelbart and what is Collective IQ? HopeLab Raises A Ruckus To Get Kids Moving! Winners Announced!